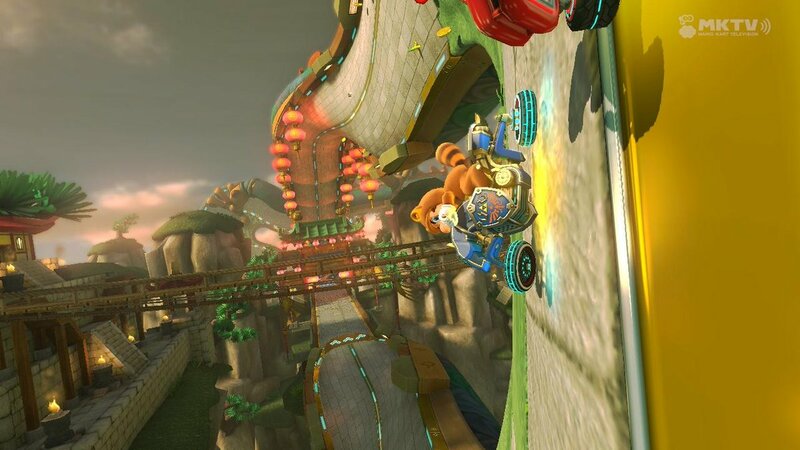 Tanooki Mario shreds a turn on the excellent new Dragon Driftway track. Admittedly, three of the tracks aren’t entirely new. Yoshi’s Circuit from Mario Kart: Double Dash!! and Mario Kart DS returns, and for good reason. It’s one of my favourite tracks in the Mario Kart series, as being shaped like Yoshi himself means lots of tight turns, and that in turn means you can – and probably need to – race the entire course in a near-constant drift. The entirely flat, stylishly pixelated version of Rainbow Road from the SNES returns, now packing Thwomps that shake the track in gigantic waves of colour on impact. Wario’s Gold Mine from the Wii is also back, with quite a few significant changes including anti-grav minecarts that actually help you and a fairly persistent JJ Abrams-style lens flare effect. Then there’s Mute City, a surprisingly on-point homage to one of Nintendo’s most neglected franchises, F-Zero. 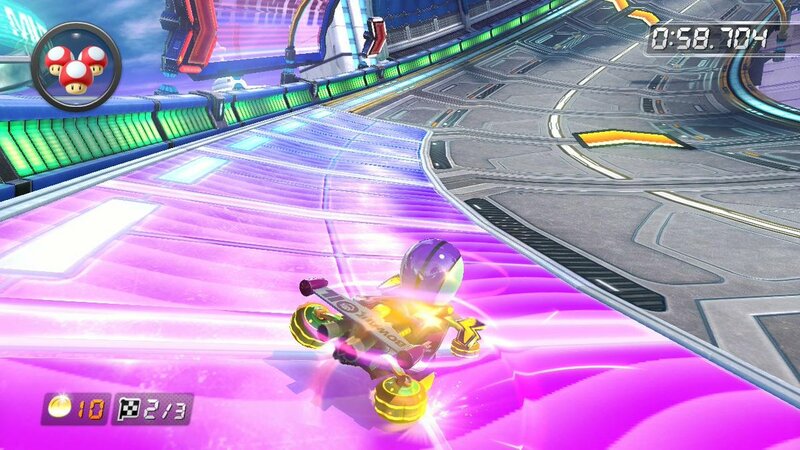 Speed is the absolute priority on this mostly anti-grav track, with boosts littered everywhere and functional glowing side panels that give you coins – and therefore additions to your top speed – at a rapid rate as long as you’re in contact with them. Racing on the track almost makes you feels like you’re playing an F-Zero game again – almost. Remember these purple side panels from F-Zero? They’re more than just pretty fanservice here. The Super Smash Bros-style nods to other Nintendo franchises continue with Excitebike Arena, a simplistic oval-shaped racetrack with ramps reminiscent of the classic NES game. It’s compact nature mean that everyone tends to stay fairly close together, promoting the kind of chaos that makes Mario Kart so much fun to play with friends. Boost jumps and boost pads are placed differently every time you play the stage, too, which is a cool feature indeed. Dragon Driftway and Ice Ice Outpost are completely original creations, and they both rock. The former is a Chinese festival-inspired visual feast with plenty of twists and turns, while the latter makes use of two thin, intertwined tracks that stay close together the whole way through, providing opportunities for quick item escapes and crafty overtaking maneuvers. The DLC is brought home by Hyrule Circuit, a dense Zelda series tribute where the coins are replaced with rupees, the Piranha Plants make way for Deku Babas, touching the Master Sword gives you a boost and every sound from the item roulette roll to the lap change chime is replaced with an aural Zelda homage. It’s glorious. Excitebike Arena gets crazy. Look at Luigi there, thinking he owns the place. 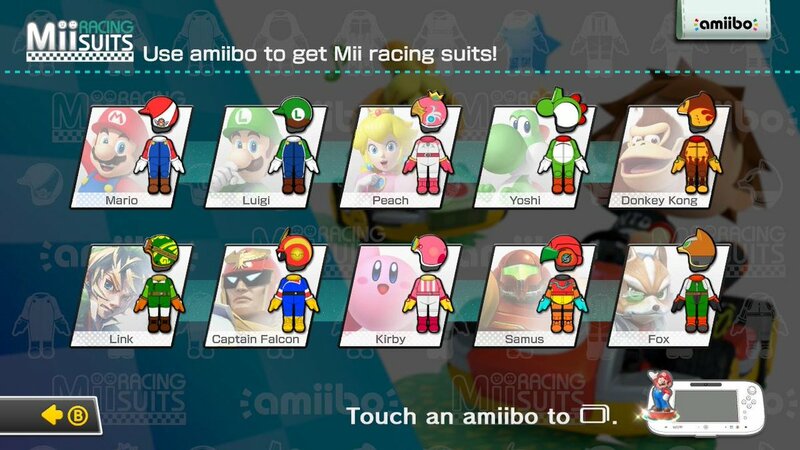 The DLC also brings with it “Version 3.0” of Mario Kart 8, which aside from adding the new content only seems to change the menu screen slightly in order to accommodate the impending launch of Nintendo’s Amiibo figurine initiative. Ten of the bazillion or so announced figurines so far will grant extra Mii costumes for use in the game. I think the stuff on offer represents a cool enough bonus to feel good about already buying a figurine, while not quite being good enough to piss off those who don’t want in. I wasn’t considering getting the DK Amiibo. Now I am. Damnit, Nintendo. I didn’t really play a lot of the 2.0 update back in August, which tweaked the game balance rather significantly, so the extra Shy Guy/Yoshi colours, the mercifully rearranged post-race menu, the menu stats, the reshuffled online system and the increased likelihood of getting a Super Horn were all relatively new to me last night. All are pretty nice additions, though I must admit I think the game is still sorely missing an options menu for changing the volume of the background music. Not only does Mario Kart 8 already have an amazing soundtrack, but the DLC tracks each have their own new musical arrangement that tends to get buried below the yelps and woo-hoos of a typical race, and that’s a real shame. Overall, though, this is an impressive offering from Nintendo. They seem to have realised that in order to combat the relative lack of third-party support on their newest home console, they must continue to add reasons for fans to go back to the Wii U games they already own. This is a damn good one. Bring on DLC Pack 2 next May. next may!!! =( can’t wait that long! the dlc is great! but the trophies are a bit basic.